Sometimes there is the need to mark multiple records at once with a temporary tag. The best way to do that is to use the Tag Selected tool. Note: The Tag Selected tool ONLY WORKS FOR FLAGS. To use this as a temporary selection, one must have an unused flag available. This can be used to change the setting of any flag field. An unused flag field will not have a descriptor. Remember, a flag field can only contain two characters. 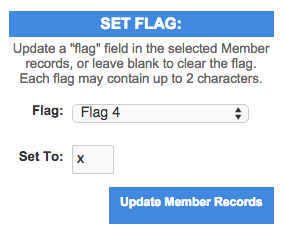 To remove the tag, click update Member records with no value set. Glad to hear. It's a great way to indicate records when a large number of them need to be deleted.